V-Card encoded temporary tattoo for booth scanning of customer details at a trade show. URL encoded temporary tattoo containing link to Facebook profile. Data encoded event entry pass containing ticket number and pre-puchased drinks coupons for on-site scanning. Business card with Google Maps location encoded QR code. Business card with V-Card encoded QR code. Business card with QR codes encoded with Facebook profile URL, Google Maps link and V-Card. URL encoded QR code linking to Material Safety Data Sheet for hazchems. URL encoded QR code linking to maintenance record for equipment. URL encoded QR code linking to the trailer for the film. SMS encoded test drive request (contains request message and mobile number of car salesman). URL encoded QR code to take users to the online micro-site for the new model. Wedding invitation with URL encoded online RSVP link. Make as many high resolution artwork quality QR Codes as you want for one low monthly subscription fee. Once you have opened an account you will be able to generate QR Codes at sizes up to 3000 pixels across and at your choice of 72dpi, 150dpi or 300dpi in either raster (PNG, JPG or GIF) or vector (EPS, SVG or PDF) format. Just the thing for graphic designers and others who need high quality QR Code artwork files for print design work. Also includes history reporting, editable dynamic QR codes, and optional short URL or native URL. 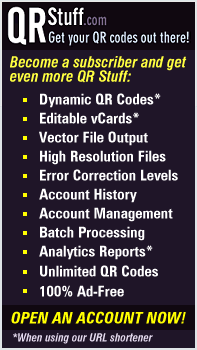 Subscribers also get batch processing - upload a single data file and generate up to 500 QR Codes at a time.